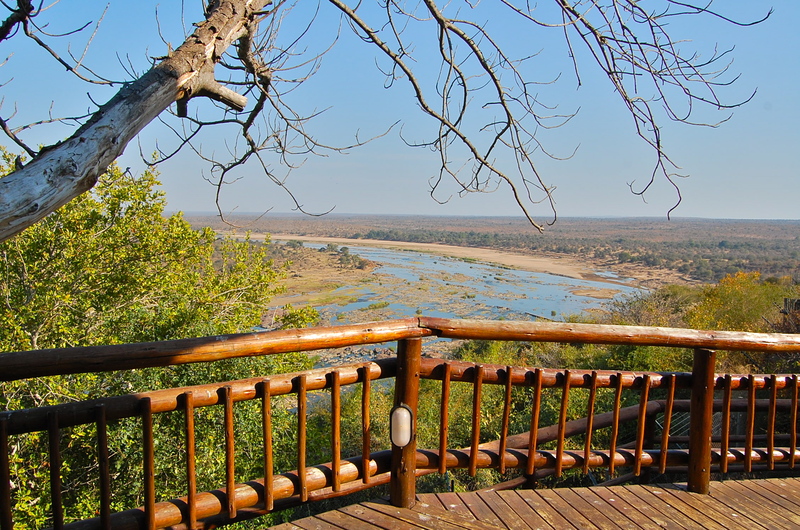 Kruger National Park is one of the world’s greatest game parks. Most visitors see the animals from the comfort of a private car or open-air safari vehicle. 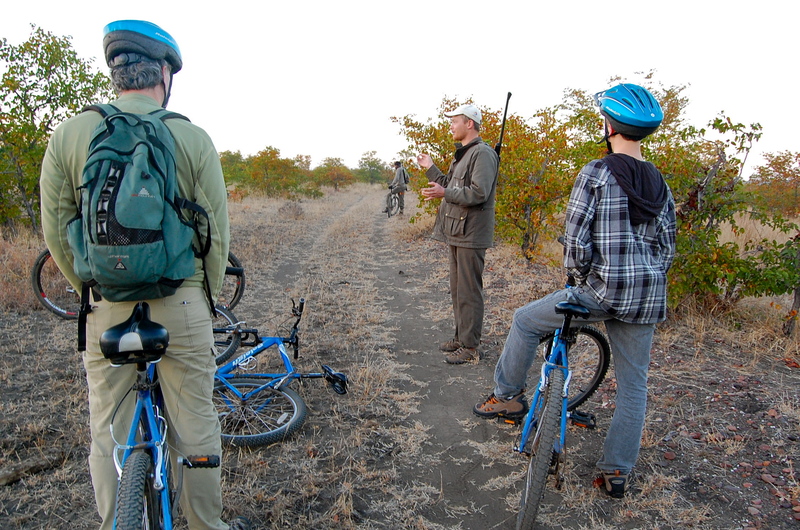 We did that too, but also opted for a more active adventure—mountain biking at Kruger’s Olifants Camp. Our two Kruger Park guides, Eric and John, gave us a safety briefing. They were to be at the front at all times, and we would follow, single file. I secured a position in the middle of the pack, rationalizing that a lion would most likely pick off a straggler at the end (my husband). Our guides reassured us that it wasn’t lions we needed to be concerned about. If anything, the skittish and unpredictable hippos posed the greatest danger. Watching the day come to life in the bush is magical…the sound of the birds, the sun slowly illuminating the thorny bushes and grasses. We got into a pleasant riding groove, and saw graceful herds of impala and zebras in the distance. I had to pinch myself…I’m biking in Kruger Park! The trail was intersected by numerous hippo paths—routes that connect daytime river habitat and nighttime grazing land. As we dismounted to push our bikes across a rubbly creek bed, my husband told John he heard a rustling sound. From that moment, everything happened at top speed. In a stern, take-charge voice, John yelled, “Get on your bikes, RIDE!” Adrenalin pumping, we charged up a small incline and around a bend. Moments later, we heard the bang of a riffle firing…then, two more shots. After what seemed like an eternity, John, visibly shaken, walked up to our group. He informed us that a 2000 kg male hippo, hidden in the brush adjacent to the path, had charged him. Sadly, there had been no alternative but killing the animal. Later, sitting safely on a rocky ledge, overlooking the Olifants River, I felt a strange combination of sadness, anxiety, and exhilaration. I was thankful that no one had got hurt (or worse), but hated the idea that I had played a role in the death of a magnificent animal. John tried to put it in perspective for us. This was the first time he had shot an animal on a bike trip, and the third time if he included the over 2000 walks he had guided in the park (no human fatalities). It still didn’t feel good. I’m not sure I would do this activity again, but at the same time I would not deter others from participating. What happened to us is extremely rare, and I have the utmost praise for how our guides handled the situation. Book well in advance on the SANparks website and make sure you get a newly renovated perimeter chalet with a river view. Half-day mountain bike excursions run mornings and afternoons, but days and times vary depending on the season. Contact Olifants Camp for current information. The tours are 3-4 hours and the price (R 210-375) includes a mountain bike, helmet, water, snacks, and two, armed park rangers. The bikes are basic, but do the trick. You should be able to ride 10-12 km and be comfortable on single-track dirt surfaces with some rocky, and vegetation strewn sections. There are plenty of rest stops. I hope I haven’t scared you off. I’m happy to provide more details and would love to hear about other people’s experiences mountain biking in Kruger, or elsewhere. Hi Tammy—Horseback would be cool! 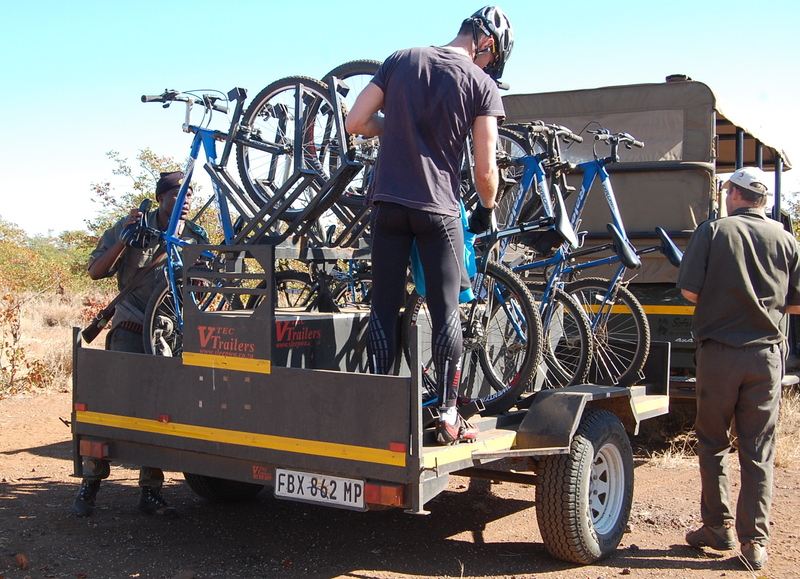 I look back on the biking in Kruger experience with mixed feelings. It was a really amazing thing to do, I just wish the hippo hadn’t been killed. South Africa is an awesome place and you are sure to see many animals. Book early in the parks. I have a few more posts about our travels to different parts of the country. If you have any questions, I’m happy to provide my two cents worth. I would do this, but I think I would like it even better on horseback. Horses run faster than I can pedal. We are doing South Africa for the first time next summer, 2016. Hope to have some close animal encounters.